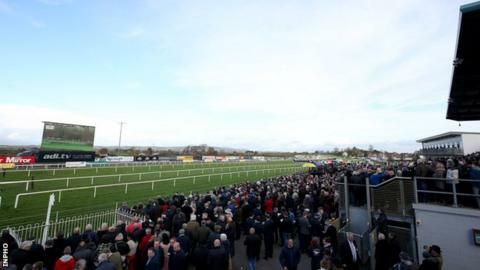 The future of horse racing at Down Royal appears in some doubt amid conflicting statements on Wednesday about the Northern Ireland venue. Down Royal officials initially said the racecourse would close at the end of this year after they were unable to agree a new lease with the landowner. However, landowner Merrion Group responded by saying that it intended to continue horse racing at the venue. "We are the beginning of an exciting new era for Down Royal," it said. Racing is said to have taken place at the track for more than 200 years. The initial statement from Down Royal Corporation of Horse Breeders said they would now consider a "number of sites which could accommodate a new race track and facilities". "There is every likelihood Down Royal will find a new home," added the Down Royal Corporation. "Down Royal's approach was always based on a not-for-profit approach to ensure the racing sector in Northern Ireland which employs between 2,000 and 2,500 people, benefited from raised standards and generous prize money," continued the Corporation's chairman Jim Nicholson. "All profits have always been ploughed straight back into the sector. It is essential to the future of the sector that this contribution continues." The statement added Down Royal Corporation of Horse Breeders, led by Mr Nicholson and general manager Mike Todd, has invested more than £5m into the venue's facilities. However, Merrion Group's statement in response said it intends to "assume the day to day operation management of Down Royal, with horse racing at its centre". "The withdrawal of the Down Royal Corporation of Horsebreeders from the Lands Tribunal process brings forward that outcome and we will continue our preparation to deliver horse racing from the beginning of 2019," added the Merrion Group statement. "We are looking forward to a new era at Down Royal and to enhancing the experience of race goers and other stakeholders while contributing to the local and wider community. "We will maintain contact with local stakeholders, including political representatives and Lisburn and Castlereagh Council as we develop our plans." In recent years, Down Royal has held 12 meetings every year including their showpiece Festival of Racing every November. This year's big meeting takes place on 2-3 November while the venue's final card before the current management move out will be on Boxing Day.